We have talked a little about trademark and patent protection in past blog posts. 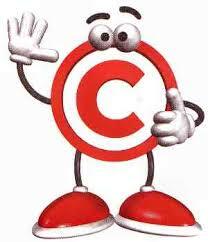 Now it’s time to give you a little overview of the law of copyright protection. Like Patent Law, and unlike Trademark Law which may be protected by State Laws in the United States, copyrights are only the concern of the federal government. That’s right, if you want copyright protection in the long run, you have to deal with the United States Copyright Office in Washington, DC. Luckily the Copyright Office is made up of very friendly folks and even better, you don’t have to register your copyrights to have protection! Anything you write, draw, film, etc. is protected by copyright in the United States from the minute you fix it in a tangible means of expression. The only time you have to register your claims to copyright is if you need to sue an infringer in a Federal Court to stop them from copying your stuff. According to the US Federal Copyright Act,” Copyright protection subsists in original works of authorship fixed in any tangible medium of expression from which they can be perceived, reproduced, or otherwise communicated, either directly or with the aid of a machine or device.” The word “original” here just pretty much means that the work is original to you, that is, you haven’t copied it from somebody else. It doesn’t mean that you only get protection if you write the Great American Novel or paint the Mona Lisa. Pretty much anything will do. There are some special rules dealing with employees and independent contractors that you need to understand. Usually, the vast majority of stuff that an employee creates that might be subject to copyright, which was created within the scope of the employee’s employment, will belong to the employer. Still, it might be a good idea to have employees agree in writhing to that effect at the beginning of their employment with the company. Your lawyer will be able to draft something up for you that will do the trick. Working with independent contractors who create copyrighted material for you is not quite as simple, so we will go over that situation in a future post.